Micropayment hope springs eternal. Clay Shirky and Andrew Odlyzko drove a stake in its heart way back in the dot-com era, but here it is again -- with new, more frictionless payment solutions and new content aggregators, some counting on the magic of blockchain and cryptocurrencies. Some micropayment content services have gained limited traction, primarily in Europe. But as Shirky said, "their weakness is systemic." Decades later, these systemic problems remain unsolved. But that is true of micropayments as currently conceived: small payments at pre-defined rates. When the rates at which micropayments are charged become more reflective of the dynamics and behavioral economics of actual value -- as received and perceived by the customer -- that systemic problem can be solved. How can that be? Odlyzko's conclusion: "The lesson of behavioral economics is thus that small payments are to be avoided, since consumers are likely to pay more for flat-rate plans/"
Now it is not so much the "ticking clock," as "the ticking meter," but the problem remains. Much like Monty Python's Spanish Inquisition: "surprise and fear." Fear that we may be surprised to have run up a large bill without realizing it. It may be only a little regrettable, or it may be very seriously regrettable. We will be stuck with that (or try to plead with the Inquisition's customer service department for forgiveness). Even if you make the micropayment process totally frictionless, surprise and fear remain. We think of micropayments as immutable quanta of price. So many cents or micro-tokens for so many units of service. But why are we stuck with such Newtonian pricing, when Einstein showed us that clocks and meters can expand or contract relativistically? We forget that prices need not be pre-set, but can be dynamic, and that they should adapt to whatever the customer and the business agree is fair. Prices should be relative to value, as I said above: reflective of the dynamics and behavioral economics of actual value -- as received and perceived by the customer. The most systemic solution to the problem with micropayments is to apply post-pricing, in the form of post-bundling. We are talking about micropayments for digital "experience goods," which are unlike traditional "goods:"
They have little marginal cost. Their value is not really known until after the experience. They are typically bundled such that the mix of items and amount to be metered is not known until the entire bundle is chosen by the customer, on demand, during the course of a billing period. The vendor can afford to take on most of the pricing risk (since the marginal cost of service is negligible). The unit price should be discounted to provide quantity discounts (and to adjust for items sampled but not finished). Price caps can be applied to ensure reduce surprise and fear. Such a cap might be higher than the corresponding rate for a simple flat-rate subscription, to compensate for the expectation that the customer will often pay less than the cap or even the usual flat-rate, but still low enough to eliminate the customer's fear. Post-Bundling -- Packaging Better TV/Video Value Propositions with 20-20 Hindsight explains how this could be applied to TV subscription bundles. The core idea is that micropayments are most relevant to recurring business relationships, whether with a single content/service provider, or with an aggregator of such content/services. In either case we need to look beyond individual transactions to the aggregate value transfer over a period, in the context of the ongoing relationship. Subscription businesses already recognize that Customer Lifetime Value (CLV) is their primary success factor. 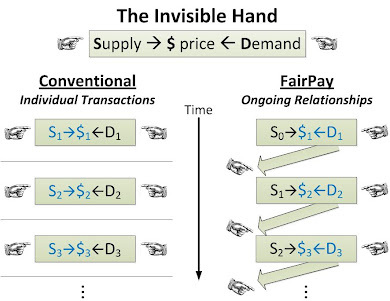 Advanced forms of FairPay take this farther, eliminating fear by allowing the customer to pay no more than they think fair for any given billing period -- as long as they do not abuse that privilege. That is just another level at which to leverage the "free" replication of digital content/services to eliminate the customer's pricing risk. Whatever degree we take it to, when we shift to this relationship view, we realize that the vendor can absorb most of the short-term pricing risk, as long as the overall relationship is profitable over the lifetime of the customer. They can use the meter as just a guide, applying it to get a price that is adaptive to the nature of the relationship. 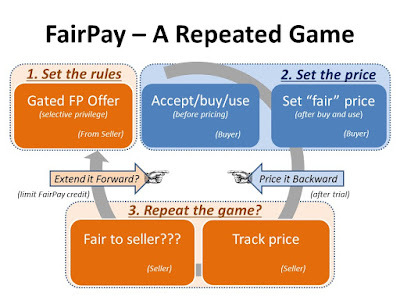 The business can track each customer's fairness reputation over time, and use that to decide how much pricing power to grant and when. That enables prices to be set in a way that eliminates the customer's fear of nasty surprise. If we can remove that "anxiety and confusion," users' hatred of micropayments will turn to love. Good relationships build and thrive on comfort -- give customers the comfy chair! Interestingly enough, the critics of micropayments argue that the success of flat-rate subscriptions dooms micropayments, but now it is becoming apparent that the success of subscriptions is self-limiting. So many services are turning to flat-rate subscriptions that consumers are facing what Danny Crichton called "Subscription Hell." Another week, another paywall. ...I’m an emphatic champion of subscription models, particularly in media. Subscriptions align incentives in a way that advertising can never do, while also avoiding the morass of privacy and ethics that plague ad targeting. ...Incentive alignment is one thing, and my wallet is another. All of these subscriptions are starting to add up. ...Worse, subscriptions aren’t getting any cheaper. ...I’m frustrated with this hell. ...And I’m frustrated that subscription pricing rarely seems to account for other subscriptions I have, even when content libraries are similar. ...For product marketers, the default mentality is to extract a lot of value from the 1% of readers or users that are going to convert to paid. Subscriptions are always positioned as all-or-nothing, with limited metering or tiering, to try to force the conversion. To my mind though, the question is not how to get 1% of readers to pay an exorbitant price, but how to get say 20% of your readers to pay you a cheaper price. It’s not about exclusion, but about participation. ...Subscription hell is real, but that doesn’t mean the business model is flawed. Rather, we need to completely transform our thinking around these models, including the marketing behind them and the features that they offer. We also need to consider consumers and their wallets more holistically, since no one buys a subscription in a vacuum. For too long, paywall playbooks have just been copied rather than innovated upon. It’s time for product leaders to step up and build a better future. I have made similar points in a number of posts, most pointedly in Beyond the Deadweight Loss of "All You Can Eat" Subscriptions. With a broader relationship view, we see that the apparent dichotomy between flat-rate subscriptions and discrete "pay per view" micropayments is an artifact of our narrow, transaction-level thinking. We think of micropayment transactions as isolated quanta that add up in ways that cause "anxiety and confusion" because we do not think about how the metered units map to actual value. We think of flat-rate subscriptions from the isolated perspective of a single provider, because our vendors do not think about the whole customer, and what other subscriptions make competing demands for "share of wallet." But if we look past those blinders, we see that we exchange variable levels of value, and each should draw a fair share from the consumer's painfully finite wallet. To solve the systemic problems of payments that sustain the creation of digital services -- whether micropayments or subscriptions -- we must take a systemic view of value, share of wallet, and pricing risk. 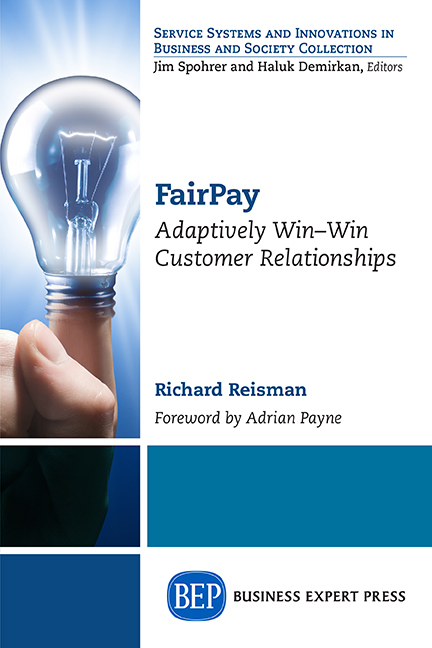 That is why my book has the subtitle "Adaptively Win-Win Customer Relationships." Most of us can have nearly all of the content and services we want, at a fair and affordable price -- if businesses get smarter about sustainably exploiting the nature of digital services in a cooperative relationship context. Total removal of surprise and fear from pricing is inefficient and impractical, and benefits few. Even with flat rate, we have the converse fear that we will not get our money's worth in any given month. But businesses can leverage digital abundance (that costs them nothing) to put limits on the fear. They can seek to put each of their customers into a comfy chair that is cooperatively and adaptively designed to fit them just right. Failing to do that will be a tragic waste, for businesses and consumers alike. [Update 2/16/19: Many advanced examples of better flexibility are on this blog, but one of the simplest is this one: Post-Bundling – Packaging Better TV/Video Value Propositions with 20-20 Hindsight.